With coloring being so popular I believe it will be the gift to give this Mother's Day holiday. I want to share a beautiful coloring book. 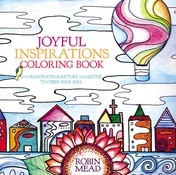 JOYFUL INSPIRATIONS COLORING BOOK by Robin Mead is perfect for gift giving. This book has simple lines and sketches that will be perfect to fill in with colored pencils. There is scripture and quotes weaved through out this gem. The past time of coloring is so relaxing and the simplicity of these designs will truly be perfect for unwinding. Get your copy of JOYFUL INSPIRATIONS COLORING BOOK at your local bookstore or online at stores like Amazon. Thank you so much for your beautiful review..!